First, don't skip the instructions. There is a lot of functionality in this little device, so expect to do a little more than just plug it in. The time spent may just prevent a crash one day. Have a comment or a question not answered here, email us. Also check out VoltMagic simplified by Ron Lund of HeliProz South. After a fresh charge on a battery (LiPo, A123/LiFe, or NiMh/NiCd), the top green LED is lit. After the first flight it's usually on the second to last green LED. Is this normal? Yes, battery voltage drops off quickly at first, then very slowly, until it starts to drop off faster as the end of the charge approaches. Voltage at the top is a good indicator that the battery was charged recently. How do I decide what Average Voltage range to use for my battery? Tech Tip: At about 45% capacity, it should typically be on the last green LED after turning on the radio and stirring the sticks. You could discharge to this level and set the Averaged Voltage range so it's on the last green LED. Click the chart at left for A123, NiMh, NiCd examples. For best precision, do this test with a charger that reads out the mAH charged or discharged: First, fully charge the battery and then discharge it to about 45% of capacity using the charger. Now discharge the battery further using the servos until the yellow LED stays on. The most repeatable reading is with the servos at idle, but after some load (stirring the sticks). For future reference, take a quick reading with an accurate loaded voltmeter (2 decimal place resolution), then discharge the remaining mAH on the charger and note the mAH reading. If desired, change the AV range of VoltMagic up or down and repeat the test. I have the newer version with normal and low range PLV. With Normal Range PLV it blinks yellow or red, but on Low Range it's good. Should I use Low Range PLV, or upgrade the battery, regulator, or switch harness? It's up to the pilot. High power servos often make it very hard to keep the peak low voltage out of the yellow or red using Normal Range PLV. In this case, we generally recommend to configure for Low Range PLV. (see Table 2 for the trigger points). NOTE: For Low Range PLV with the 4-cell or regulator ranges, the first yellow PLV alert is 3.8 volts. This is the same voltage at which some manufacturers initiate their battery failsafe IF a time delay period elapses. The voltage will spike below 3.8 momentarily BEFORE it stays low long enough to initiate the battery failsafe. Absolute minimum voltage requirements vary, and manufacturer’s ratings may not include this information. Some airborne equipment may require 3.5 volts (or more), some may tolerate 3.0 volts. The failure mode from momentary undervoltage also varies widely. Notable is the reconnect time for some types of receivers (see 2.4 GHz). If LED’s 5-8 still blink with Low Range PLV selected, see Troubleshooting low PLV and the next FAQ below. My airplane or heli has PLV (Peak Low Voltage) blinking at the red LED when the battery has plenty of capacity left. It will even blink the red LED on the ground if I wiggle the sticks fast. The battery checks fine with my loaded battery tester (ESV). I've been flying it this way for a while, so it must be OK -- right? Here's a graph of what can happen to voltage. This example is from a regulator and Li battery setup with five digital servos moving simultaneously on the bench without load. The voltage was 5.2 with the servos at idle, and the 4000mah Li battery was >7.2V under a 1 amp load, so it appeared satisfactory -- EXCEPT that VoltMagic had two blinks on the lowest red LED from simply stirring the sticks. Obviously, un-regulated battery setups can have the same issues. This is just an example to illustrate what Voltmagic detects that common methods don't. At over 1000 samples per second, VoltMagic catches the true PLV that slow hobby meters and data-loggers can't. And, VoltMagic catches these on the ground during a pre-flight when they are just a couple milliseconds long. Stirring the sticks at preflight, which quickly reverses the servo motors, causes maximum current for a very short time. It's a preview of what will happen in-flight that only a fast device like VoltMagic can see. First, double check that VoltMagic is configured for the right range. The LED pattern for the configured range is displayed on power up at the end of the LED test. If the range is correct, it's trying to tell you something. Most airborne equipment will still function down to a bit under 3.6 volts, but safety margins are like insurance, there when you need them. Note: Since 5-Cell Ni and 2-cell Li packs (without a regulator) run at higher voltages, more voltage drop can be tolerated. However, this could lead to not detecting problems early enough, so the PLV trigger points are raised appropriately for these ranges. Current VoltMagic versions include Normal and Low Range PLV to further customize the monitor to your setup. For the given servo load, the battery, regulator, switch and/or connecters are not keeping the voltage above the indicated PLV. Note that the PLV must actually go lower than the trigger point for the appropriate LED to blink. See the TROUBLESHOOTING page, and top reasons for low PLV. Hint: If the PLV is still low after configuring VoltMagic for Low Range PLV, the most common cause is that the battery has too much internal resistance (high impedance) for the servos. This is what causes voltage drop from a battery as current increases. Most hobby store batteries (even lithium ion for regulators) are marginal or worse with multiple digital servos. Why is the PLV (Peak Low Voltage) scaled differently the the AV (Averaged Voltage)? Why does a blink on a particular LED not mean the same voltage as when lit steady? It could take over 20 LEDs to cover the spread from highest to lowest voltage in 0.1 volt increments, so blinking is a space-saver. Also, color is a factor -- 4.7 volts is low (red) for Averaged Voltage, but it's exceptionally high as PLV goes. So using blinks for PLV with a different scaling makes a lot of sense. You could keep a copy of Table 2 in your field box and hi-lite the range it's set for. The color of the blinking LED gives a quick indication of severity level, so knowing the precise voltage isn't necessary to spot a problem quickly. When it's cold, the PLV (peak low voltage) is in the yellow or red when I "stirred the sticks" on pre-flight. Indoors it was back to normal. Are batteries that sensitive to temperature? Different batteries will handle temperature differently, but generally batteries are best on a warm day. A good pre-flight should include rapidly moving the servos and checking the PLV. My airplane or heli has PLV (peak low voltage) blinking at the yellow LED about when I normally charge the battery. Is this common? Often that's the case. It depends on the current load of the servos, discharge curve of the battery, and the associated voltage drops in the system. Can batteries wear out and have less voltage with the same maH? Yes, due to increased internal resistance. VoltMagic typically shows a lower battery voltage, and/or lower Peak Low Voltage. It looks like the battery needs charging, even though it has plenty of maH remaining. Sometimes it happens gradually over the life of the battery, but not always. Here's an example: A particular 4-cell pack was reading much lower on VoltMagic then it had the previous flying season, but it cycled on the charger within 2% of rated maH capacity. It measured 255 mOhms using a 1000 Hz impedance test compared with 55 mOhms for a one year old pack with the same cells. Similarly, using the IR test on a 1010B+ Charger (3.09 firmware) the results were 301 mOhms compared with 80 mOhms. These tests were at full charge, 20 deg C (68 F), and include connector and wiring resistance. Will adding a capacitor raise the PLV? I've seen this on the internet, it had a plug like a servo so it plugged into the receiver. This may help with very short duration transients, especially with a BEC or Regulator. We tested an ESC with an internal BEC in a 450 size heli (with 3 Hitec HS65MG on the swash and a JR 3400g on the tail). There was about 0.2 volt higher PLV with a 470uf capacitor plugged into the receiver, but results can vary widely depending on the particular BEC/Regulator and the servos. Make sure the voltage rating is higher than the maximum voltage plus a safety margin of about 2:1 or higher -- The failure mode of a capacitor could be a short circuit with near zero volts resulting. We made ours from an old battery lead and a 16 volt, 470uf radial capacitor. 470uf is relatively small, the larger the value the more effective it will be. We've read reports of 1000uf per digital servo being a good starting point. If you want to try this, make sure the polarity is correct on the capacitor when you solder the wires to it. What is typically a good 4 or 5 cell NiCd or NiMh, single battery setup with DIGITAL Servos? BATTERY - A pack with cells such as Sanyo 1950HR4/5FAUP, N1900SCR, CP2400SCR, eLite 1500, 2000 with about 5 milliohms impedance. Some digital servos exceed 2 amp peaks. Impedance (and peak amperage) determine the voltage drop, not the batteries mAH capacity. SWITCH HARNESS - Futaba HD (or equivalent). Replace the battery connecter with a PowerPole or Deans. Optional: feed the receiver with two leads to further cut resistance and voltage drop (click for big pics). VOLTMAGIC - PLV (Peak Low Voltage) is a good indicator of how well the setup is maintaining voltage. Above is a 5 amp discharge test of a Sanyo 1950FAUP (black) and a generic 2700 maH battery pack with "A" size cells (red). 5 amps is an arbitrary choice to illustrate differences in batteries, every setup will have a different peak current. At higher peak currents, voltages would be lower then the graph shows (and vice versa). 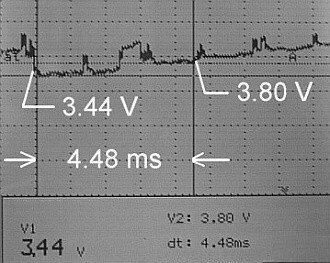 Even though average current is usually less, peaks of 5 amps would cause a voltage drop to the level shown in the graph. (Also note that a battery has capacitance that tends to dampen extremely fast voltage fluctuations.) Only the voltage drop of a single R/C connector on the battery is included on the graph. A switch or connecter with excessive resistance could make either battery significantly lower. VoltMagic is looking for these problems when you stir the sticks on pre-flight, and while you fly. Without VoltMagic, you could probably fly the "red line" for quite a while and not even know how little safety margin was left. The same potential exists for voltage regulators. What about DUAL batteries? How are they better? Dual batteries packs in parallel, each with their own switch harness, are basically twice as good. The voltage drop is half of what the same single pack would be, and the mAH is double. Good choice for larger aircraft. I've read on the internet to not use NiMh batteries because they have more voltage drop then NiCd batteries, is this true? The battery chemistry, NiMh or NiCd, tell you nothing about the impedance or the voltage drop under load. Either type can be made for slow discharge and low amps, or fast discharge and high amps. The latter is what you likely want for digital servos, the lower the impedance the better they'll maintain voltage. When NiMh first came out they were mostly slow discharge, so that's the reputation they started with, and it still haunts them today. Actually, some of the lowest impedance cells are NiMh. Side note: More mAH doesn't necessarily mean less voltage drop either. Bottom line, If you measure the PLV, you don't have to guess about minimum voltage. I'm having trouble getting into configuration mode; what might be the problem? The instructions say to continuously toggle the channel connected to VoltMagic back and forth quickly during the first 3 seconds after power up until green LED 1 starts blinking (LED 1 blinks continuously during configuration). Then, toggle the channel slowly to step through the choices. "Quickly" and "during the first 3 seconds..." are the key words. You can also plug a servo in place of VoltMagic, then verify it moves with the correct switch or control. Also note that the ATV/End Points for the channel connected to VoltMagic have to be 85% (or more) to enter configuration. Check transmitter programming for any mixes or settings that might affect the channel. With Lithium (LiPo) batteries and a voltage regulator, where should VoltMagic be connected? While VoltMagic can monitor the two cell Li battery itself (good for testing if the battery voltage is sagging too much under load), the best place is connected to the receiver so it can monitor the output of the voltage regulator and check for glitches or failsafes. If the Li battery dips too low at the input of the regulator, it will show up as low voltage at the output. Regulators require the input voltage to be higher, often at least 1 volt greater than the output. Of course, the ideal setup is with servos that handle the voltage without a regulator. If you want to monitor a Li battery powering a regulator, the balance tap may be convenient for connection. A micro receiver switch can be adapted, one side to the balance tap and the other connected to VoltMagic. I'm testing the glitch detection by turning the transmitter off, or by turning on another transmitter on the same frequency. It doesn't seem to work unless I leave the transmitter and receiver on for a minute before testing, why? VoltMagic checks for the existence of servo pulses after one minute of operation. If pulses exist, glitch (or failsafe) detection is enabled at that time. 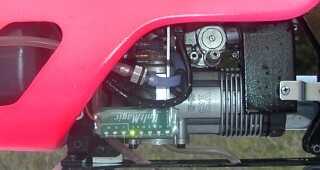 The one minute delay allows time for turning on the transmitter, noise from a glow plug connector, etc. Note that with 2.4 GHz and PCM radios, a glitch (i.e. missing or abnormal signal pulse) is from a receiver failure (possibly a reboot). It's not related to the transmitter and can't be tested by turning the transmitter off. I'd like to use VoltMagic's Failsafe Detection, but I'm having trouble setting up the failsafe (for the channel connected to VoltMagic) on my transmitter. Every transmitter has a slightly different procedure for setting a failsafe. If you haven't already, read the section in your transmitter's manual regarding failsafe setting. There are usually two types of failsafes that you can select for each channel: "hold last position" and "preset position." The "preset position" is what you want for VoltMagic and your throttle (idle). All the radios we have seen require that you use a switch, dial, or joystick to set the particular channel(s) to a desired position, then press something to memorize that position as the failsafe. Most radios set one channel at a time, but some set all the channels at once. The term "position" is used because typically we're talking about a servo, but in the case of VoltMagic it's just a signal. The "position" that VoltMagic will count as a failsafe is full maximum (not 100% but the max endpoint or ATV for the radio) in either direction. If the channel uses a two position switch, either position will work. If the channel uses a dial, full clockwise or anti-clockwise will work. Double check that you don't accidentally have a Pmix or other function acting on the channel. After the failsafe position is set to this maximum value, the end point or ATV must be reduced (to 85%) so the switch or dial doesn't put the signal going to VoltMagic in the failsafe zone and create a false alarm. There is no point in repeating the VoltMagic Installation Instructions here, so read the section on Glitch or PCM Failsafe Detection and then follow the steps. Notes for Futaba 9C radios (typical of many radios). Check that the THR>NEEDL mixing and GOVERNOR function are either inhibited, or not using the channel VoltMagic is connected to (pages 58 & 97 of the manual). There is also some important info on page 39 about functions that can take over a channel. On page 43 is the Failsafe setting procedure. Note that you have to select the channel on the screen (each channel is set separately) AND you have to hold down the "wheel" for greater then 1 second to confirm. The transmitter sends the failsafe settings at 2 minute intervals, so wait 2 minutes before turning the TX off for a test. Channel 9 doesn't have a failsafe position, use channel 7 or 8 and use 9 for something that doesn't need a failsafe (e.g. governor on/off). Failsafe positions for the 9Z are set individually for each channel (hold last position is also an option for each channel). For the VoltMagic channel, set the AFR (Adjustable Function Rate) to 100% in both directions for all flight conditions. Set the ATV for the VoltMagic channel to 140% on both sides, then set the failsafe, which should read plus or minus 100% on the F/S screen (the ATV and failsafe are scaled differently). The switch (or control) for VoltMagic must not be in a mid position when setting the failsafe. After setting the failsafe, set the ATV to 85% on both sides for all flight conditions. LIM mode for ATV is preferred because AFR or PMX will not drive the signal into the failsafe zone (useful if the channel is shared with something that doesn't mind the VoltMagic failsafe position). Failsafe is code 77. The options are different depending on whether ZPCM or SPCM is selected (hold last position is an option for each channel with SPCM). Channels 9 and 10 do not have a failsafe position, use channel 7 or 8 and use 9 and 10 for something that doesn't need a failsafe (e.g. governor on/off). Since failsafe positions for the 10X are all set at the same time, ensure the throttle is set to idle and the other controls are where you want them. Set the ATV for the VoltMagic channel to 150% on both sides, then set the failsafe. The switch (or control) for VoltMagic must not be in a mid position when setting the failsafe. After setting the failsafe, set the ATV to 85% on both sides. The higher end models (e.g. Futaba 8+ and the JR 12+ channel 2.4 GHz receivers) have Failsafe Positions for all channels, so counting failsafes is possible with VoltMagic. Just follow the instructions in the applicable radio manual and the VoltMagic configuration guide. Note that counting Failsafes is optional, see below. For radio systems that can't set failsafe positions for channels other then throttle, leave VoltMagic set for "Glitch" mode. VoltMagic will still count abnormal or missing pulses which should NEVER happen with a any 2.4 or PCM system that is operating correctly. If this happens the RX may be faulty, or perhaps it rebooted. Spektrum AR7100R receiver with built-in RevLimit governor: Don't plug VoltMagic into the spare throttle channel if the built-in RevLimit is used, otherwise glitches will be counted (LED 1 blinking) during RevLimit operation. Spektrum may change firmware, and there is no harm in trying this. My transmitter doesn't have ATV (end point) adjustment OR failsafe setting for channel X. Can I use FAILSAFE detection on channel X? (Often channel 9 or higher). Is stirring the sticks and checking the PLV with VoltMagic on pre-flight really worth doing? Aren't the voltage dips going to be much lower under load while flying? Quick reversal of a servo's direction causes current spikes that approximate actual flying. If your battery is getting low and the PLV is blinking after a flight, try this: Stir the sticks and compare the PLV (Peak Low Voltage) to what you had while flying. If your not an super aggressive pilot, the PLV on the ground may actually be lower! The duration of the dips is longer under load, but the voltage at the bottom of the dip is usually close to the same. NOTE: Common hobby data-loggers, watt-meters, and multi-meters are usually too slow, and don't indicate the true minimum voltage (PLV). A scope will give comparable results to VoltMagic, but the price tag is pretty high, there's no glitch or failsafe counting, and the flying weight is tremendous. Where is a good place to mount VoltMagic on a heli without a clear window in the canopy? Here's a picture of a MinAir Fury with VoltMagic double-stick tape mounted to the left engine mount. Avoid servo extensions and keep the wires away from the fan area. If you mount it upside down, it's easier to read while hovering inverted. What are some ideas to reduce or eliminate glitches? Glitches can be caused by the transmitter, receiver, external interference, or interference caused by the aircraft. Always check the radio equipment on the ground for proper range, then use VoltMagic to detect glitches while moving the transmitter antenna, etc. Route the receiver antenna away from the aircraft as much as possible and avoid things that would shield it or introduce noise. Interference from the model itself is typically from loose parts rubbing and/or static discharge. No, and a loaded volt meter is not a substitute for VoltMagic. The adjustable battery voltage algorithm in VoltMagic is an excellent indicator, but two types of testing give the best reliability. The peak low voltage and glitch counting with VoltMagic are beyond the scope of a loaded meter; but just as important. * To accurately use a known load and voltmeter to estimate battery capacity remaining, the voltage discharge curve of the battery must be taken into account. Rules of thumb are often inaccurate and obsolete. Should I try and seal up the ends on VoltMagic to keep exhaust and oil out? No, all that will happen is that you will keep whatever gets in from draining out. Generally this is just a cosmetic issue, VoltMagic works fine even immersed in fuel or oil. Of course, it's best to keep it away from engine exhaust. Do any servo manufacturer's recommend installing a monitor when using digital servos? Why do digital servos draw more current? Yes, Futaba has recommended installing a monitor. See this paper about digital servos, it's near the bottom. The instructions are available for download as .pdf files. VoltMagic - Don't take off without it!